Honey bees make a permanent nest. While wasps, yellow jackets, and hornets occupy their nest for only one year, a honey bee colony may exist for a number of years. Honey bee colonies are quite large as well. 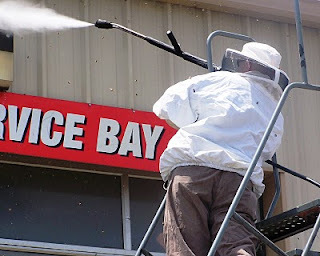 At Peace Bee Farm we try to maintain a population of 60 thousand bees in each hive for honey production. Feral bees, living in a cavity, may have even larger populations. With the natural home of the honey bee being a cavity in a hollow tree, a hollow space between the walls of a house makes an attractive cavity. A friend called me and said that she was having a problem with the honey bees living in her house. A year ago we discussed the bees which had been in the walls at the back of her house for several years. She and the bees shared the dwelling harmoniously. The house held two colonies in the walls; a third colony occupied a hollow tree in the lawn. She was content to leave the bees alone until someone offered to kill the bees with diesel fuel. A month later, thousands of bees covered the outside wall and honey began flowing inside the house. The homeowner’s helpful neighbor actually created quite a problem. By killing a large portion of one honey bee colony in the wall, he left its honey stores exposed to hive scavengers. Wax moth and small hive beetle larvae destroyed the beeswax honeycomb allowing the honey to flow into the house. I am attempting to transfer the bees from the walls of the house into two hives containing colonies that I established this spring. The hive entrances are located inches away from the bees’ entrances at the house. 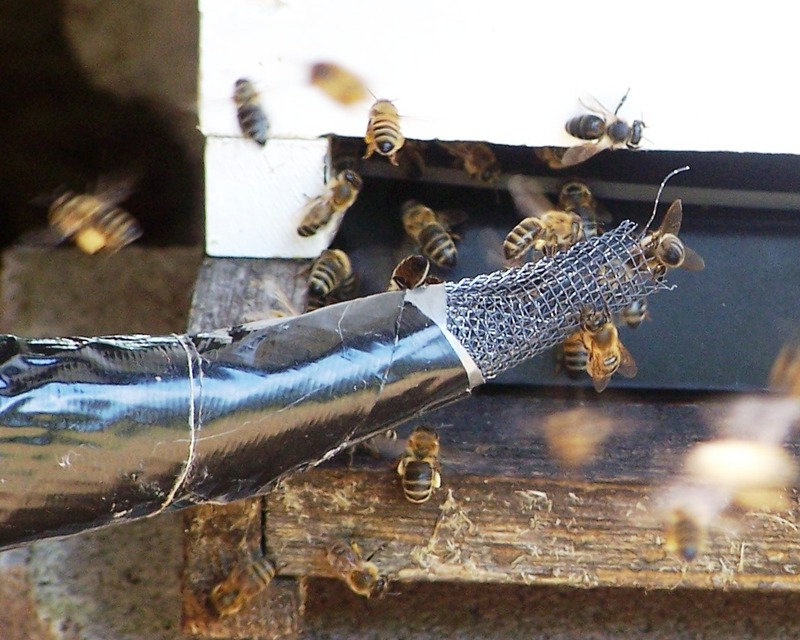 A screen wire funnel allows the bees to leave the house, but not re-enter. Overwhelming the guard bees, the house bees will integrate with the colonies in the hives. The presence of large numbers of pollen foragers indicates the transfer is working well. The important role played by the pollinators is becoming more apparent as people recognize that many of their species are declining in numbers. I am regularly approached by individuals who say that they are just not seeing any pollinators in their lawns and gardens. Some are not getting the vegetable crops that they expected as a result of not having adequate numbers of pollinators. One person told me that he had a “perfect” lawn in his front yard with no dandelions, weeds, or clover. However, he had a garden in his back yard that was not producing anything. He said that maybe he should stop spraying and let some clover grow for the pollinators. Many of the causes of the decline in pollinators are man-made and can be attributed to the loss of habitat and forage. To spread the word of the importance of the pollinators, this week has been declared National Pollinator Week. Visit the Pollinator Partnership web site at http://www.pollinator.org/ for ideas of ways to help protect the pollinators. The Partnership manages the North American Pollinator Protection Campaign in the United States, Canada, and Mexico. One way that we can rapidly turn environmental conditions in favor of the pollinators is to plant a pollinator garden. This can be almost any landscape planting, herb, kitchen, or vegetable garden. Native plants are especially valuable to the bees, bats, butterflies, moths, mammals, and various insects that pollinate our flowering plants. Lists of sources of native plants can be found at http://www.plantnative.org/. Today’s photo shows a moth collecting nectar from vitex, or chaste tree. Vitex is a large flowering shrub or small tree that was brought to America in the 1600s. It blooms in the summer when the pollinators often experience a dearth of nectar, making it an important food source. 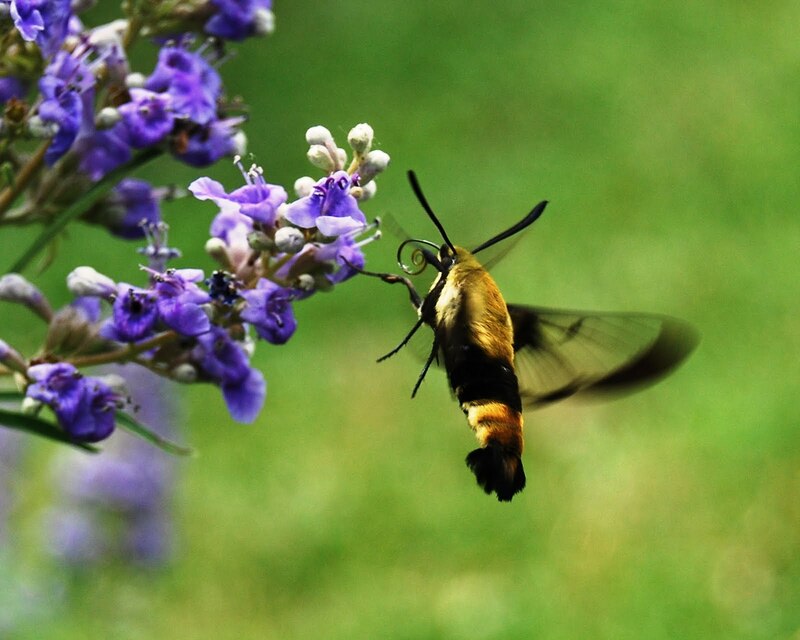 The moth hovers around the spires of vitex blooms in a flight that resembles another pollinator, the hummingbird. This moth has evolved the appearance of a bee, a protection from predators. Agriculture is in constant change as farmers develop new techniques for more effectively growing plants in changing environmental conditions or expanded ranges. One of the great changes in food production in recent years has been the movement away from mechanical tillage of crops to the use of chemical herbicides for the control of competing weeds. Mechanical tillage usually involved cultivating the centers of rows of crops to remove weeds and loosen the soil for absorption of rain water. Recent years have found an increasing dependence upon a single herbicide, Glyphosate, for controlling weeds. Glyphosate, originally sold under the name Roundup, is applied to growing crops of soybeans, cotton, corn, sorghum, canola, or alfalfa that have been genetically modified to tolerate the herbicide. These crops, called Roundup Ready, are not damaged by the herbicide sprayed across the entire field to control weeds. The use of Glyphosate has many advantages for the grower including lessening the need for mechanical tillage which is quite costly in equipment, labor, and fuel. Unfortunately, problems arise with the use of Glyphosate, as certain weed plants develop resistance to the herbicide. Roundup-resistant Palmer pigweed, growing to 10 foot heights, is forcing some Arkansas Delta farmers to return to cultivation of crops to control this hearty weed. 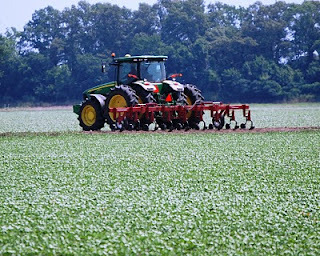 Today’s photo shows a Delta farmer cultivating soybeans. Soybeans are important honey bee forage plants. Soybeans, members of the legume family, produce considerable amounts of nectar, from which the bees make mild and flavorful honey. Just as row-crop farmers have to adjust their farming practices to changing conditions, bee farmers must adjust to changes in the environment of the bee hive. The continued introduction of honey bee pests and pathogens has led many beekeepers to move toward chemical-free techniques to prevent the pests from developing resistance to chemical treatments. Beekeepers develop Integrated Pest Management plans to help control parasitic mites, small hive beetles, a new strain of Nosema disease, and other hive problems while lessening the use of chemicals in the hive. When we evaluate honey bee colonies, we observe a number of traits to determine the quality of the queen bee. Among these traits are the behaviors of gentleness and calmness. At Peace Bee Farm, we observe each colony for its behavior just as we evaluate over-winter success, spring population build-up, brood pattern, and honey production. While many beekeepers will say that bees with bad behavior may make plenty honey or provide effective pollination service, it is much more pleasant for the beekeeper to work with gentle bees. Honey bee gentleness involves the colony’s defensiveness. Some colonies are simply more aggressive in their defense of their nest. These bees are alerted quicker, bring into action greater numbers of guard bees, travel farther from the hive, and stay alerted longer. The test of the colony’s gentleness is simply the way that the bees react when we open the hive and expose the brood nest. Much can be told of the colony’s defensiveness by the beekeeper’s waving of a hand a few inches above the top bars of exposed brood frames. Gentle bees will ignore your hand; more defensive bees quickly fly up and sting your hand. It is important to be aware that a colony’s defensiveness may change considerably through the day. A colony is usually more gentle during the daytime and more defensive in the late afternoon. Clear, warm weather makes for gentle bees; approaching rain brings out guard bees to defend the brood nest. The beekeeper should not evaluate colony behavior if environmental factors are affecting the bees. If skunks are attacking the hive at night, the colony will be quite irritable. The calmness of the bees on the frames is another heritable behavior trait that we observe. Some bees stand still on the frame, while other bees wander nervously about the frame. 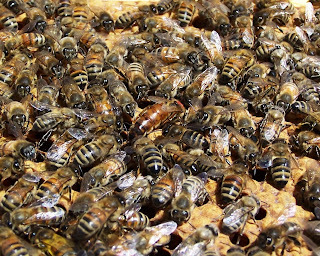 Finding the queen among thousands of nervous, rapidly moving bees is most difficult. In today’s picture a queen stands out among calm and gentle bees. Much of what beekeepers have learned about the honey bee came from direct observation of the bees in the hive. Inspections inside the hive are important, but they should be performed infrequently, during daylight hours, and under acceptable weather conditions. To allow for further study of honey bees in their hive, observation hives are constructed. These are usually hives with walls of glass or plastic. Many observation hives are housed indoors and connected to the outside by a tube for the bees to use to enter and exit the hive. Observation hives allow people to watch the bees’ activity without disturbing the hive as much as occurs when opening the hive for inspection. Just the act of smoking a bee hive has an effect on the bees resulting from interrupting and masking hive odors and pheromones used for communications. 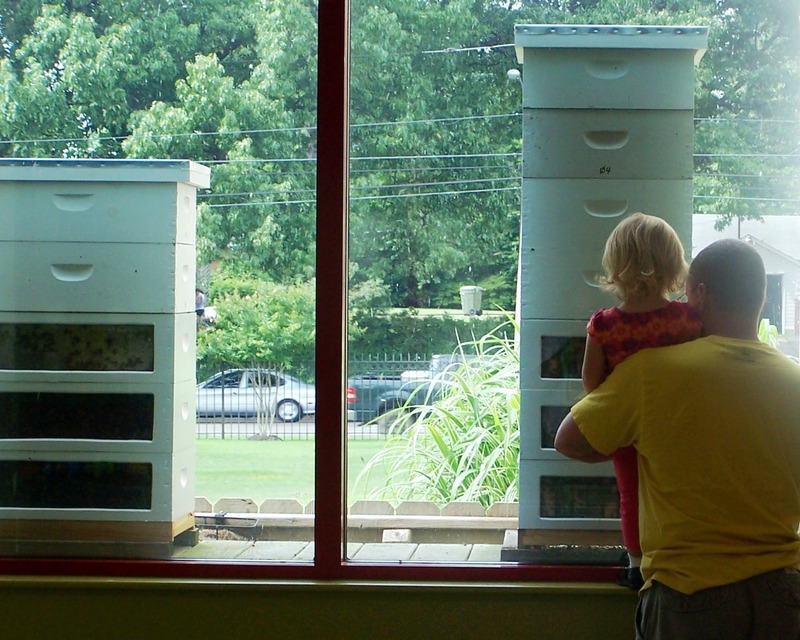 Peace Bee Farm maintains observation hives at the Children’s Museum of Memphis. These are hives modified with windows added to allow people to look inside and see the frames and bees. Today’s photo shows museum visitors viewing the bees from inside the museum. 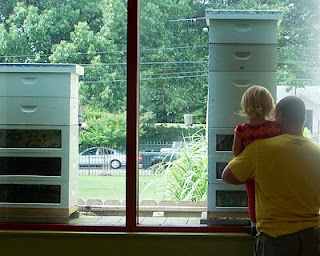 The hives are located outside a large window at a height for easy viewing by children. The children can safely look inside the hives only inches away as well as observe the bees flying in and out of the hive entrances. Visit the Children’s Museum’s web site at http://www.cmom.com/. Observation bee hives offer the beekeeper certain challenges. Most indoor hives are smaller in size than regular outdoor hives. Observation hives often contain fewer frames, and the frames are close to glass windows. In the winter, it is difficult for the bees to warm the hive. In the summer, the hive may over-heat, especially if the glass is exposed to the sun. Glass placed in observation hives for windows must be fitted flush with the inside of the hive body to maintain a proper three-eights inch “bee space.” Small hive beetles frequently attack small bee hives like observation hives. The bee hive is, of course, the home to a colony of honey bees. It also is the home to myriad other creatures, both beneficial and detrimental to the bees. Most are held to the edges of the hive by the bees that always defend their nest. Termites, which help make the cavities in dead trees that comprise the natural home for the honey bee, are a possible occupant of managed bee hives constructed of untreated lumber Tree cavities are often started by woodpeckers or chickadees and then widened by termites. If the tree cavity is large, honey bees may share it with woodpeckers or flying squirrels. Many insects live in a bee hive. The small hive beetle is a hive scavenger that entered the United States about a decade ago. The adult beetle is protected by a hard covering. Since the bees can’t kill the protected small hive beetles, the bees confine the beetles in “jails” that the bees build from propolis, or bee glue. The wax moth is another hive scavenger that regularly enters the hive. Strong colonies destroy the egg and larva stages of the wax moth. The larvae of wax moths eat the comb of weak hives. Other insects found inside bee hives include other beetles, like the lady bug beetles, native ants, fire ants, cockroaches, red wasps, yellow jackets, hornets, mud dauber wasps, and carpenter bees. Spiders, tree frogs, and mice are occasionally found in bee hives. On the outside, snakes, skinks, skunks, possum, and raccoons are regular visitors. Birds, like Eastern kingbirds, mockingbirds, purple martins, owls, and red-tailed hawks are common around bee yards. The New York Times reported on caterpillars having images resembling threatening creatures. The piece, located at: http://www.nytimes.com/2010/06/15/science/15crea.html?hpw, explains that the caterpillars evolved threatening appearances to protect them from predators. I find a spider under the cover of almost every hive. 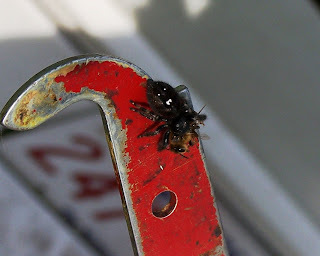 Click to see a spider, holding a honey bee. It carries an image of eyes and fangs on its back. The Mississippi State Master Gardeners held their annual conference with an entertaining hoe-down theme. I feel most honored that they invited me to speak. My presentation to the Master Gardeners involved the important role honey bees and other pollinators play in producing our food. I explained that the pollinators are declining in number as a result of changes to their environment, often man-made. Urbanization, with people spreading into remote areas, often leads to loss of pollinator habitat and diminished forage areas. Agriculture, home lawns, and golf courses employ large quantities of pesticides, herbicides, and chemical fertilizers. These chemicals, along with the residues of chemicals used in the past, tend to weaken the bees as they build up in the honeycomb. The type of industrial agriculture practiced on the large farms further lessens the available pollinator habitat and forage. Instead of agricultural fields having a weedy margin suitable for solitary bees to nest, fields are sometimes plowed to the edge of paved roads. Monoculture, or the planting of a single species of plant, is typical in large-scale modern agriculture. A lack of diversity of plants for the pollinators to forage leads to nutritional stress for the pollinators. World trade and transportation accidentally bring unwanted plants and pathogens from distant locations and spread them rapidly. Trade brought parasitic mites, viruses, small hive beetles, and the latest strain of Nosema disease to this country. Facing these threats to the pollinators, I offered the Master Gardeners a solution to rapidly help correct the shortage in pollinator habitat and forage. I suggested that these Master Gardeners direct their efforts to building pollinator gardens; they love to plant. These are plantings that provide pollinator food and habitat. A requirement is that pesticides are used prudently. I suggested that plants for the pollinator gardens be chosen from several families of plants that produce nectar and pollen: the composites, mints, mustards, roses, legumes, snapdragons, and magnolias. Thanks, Mississippi, Rita and I enjoyed the Hoe-Down. Today’s photo: honey bee foraging groundsel. Mike Worthy noticed that the queen bee reached inside each cell and measured its diameter with her front legs and then turned around and laid an egg. Tod Underhill found a drone bee with a mutation: white eyes. He also found some parasitic Varroa mites on several adult honey bees. These observations were made inside the hives; however, much can be revealed by carefully watching the outside of the hives. As beekeepers approach the hives, we look at the ground in front of the hive. Are there large numbers of dead bees on the ground? A few dozen is quite ordinary, as there typically are one hundred bees dying inside the hive every day. A thousand dead bees may mean that the bees have been exposed to insecticides. Are there bees crawling along the ground? They may tell us that there is a problem in the hives. Do the bees have their wings separated in a K shape? Are there any bees with deformed wings? Each condition can indicate bee hive diseases. Can we see parasitic Varroa mites on any of the drone bees? Conditions and activity at the hive landing boards can be quite revealing. A greasy landing board often means a queen-less hive is being robbed by foreign bees. Scratches on the front of a hive usually mean a skunk is attacking the hive at night. Bees harassed all night by skunks often sting their beekeepers all day! White-colored “mummies” of bee brood on the landing board usually means a hive has some chalkbrood, a fungal disease. Is there excessive fighting on the landing board, or are the guard bees merely checking incoming bees? Opening the hive we get to employ each of our senses. First, how do the bees sound? Are they humming gently or do they “buzz up” loudly? How does the bee activity appear? Do we see calm bees? Do we feel stinging bees? What odors do you detect in the hive? Soon we’ll taste the honey. Flowering plants attract pollinators using the same schemes that attract us to flowers: fragrance, color, shapes, and visual patterns in the flowers. Once the flowers have attracted pollinators, they offer a reward that ensures that the pollinator will return. The reward of nectar or pollen is food for the pollinator. The flowering plant expends considerable energy producing nectar and pollen. In exchange for its effort, the pollinator moves granules of pollen from flower to flower and completes a necessary step in the reproduction of the plant. Complex schemes of flowering plant reproduction evolved. The honey bees split from their carnivorous wasp ancestors about 100 million years ago at the time the flowering plants emerged. The honey bees evolved a successful survival strategy based upon a social order. The bees lived in a colony and shared common reproduction, an age-based division of labor, a continuous production of young, common food gathering, and a diet based upon food supplied by flowering plants. The successful flowering plants evolved reproductive strategies that allowed them to effectively attract pollinators. Different plants produced flowers of different sizes, shapes, colors, and fragrances. Some competed with other plants by offering nectar of greater concentrations of sugars. Flowering plants gained success in reproducing by staggering their flowering throughout the year. If all plants bloomed at the same time, it is unlikely that all would be effectively pollinated by the available animals. The flowers that we see today are the end result of genetic trial and error. Each flower fits into a niche. 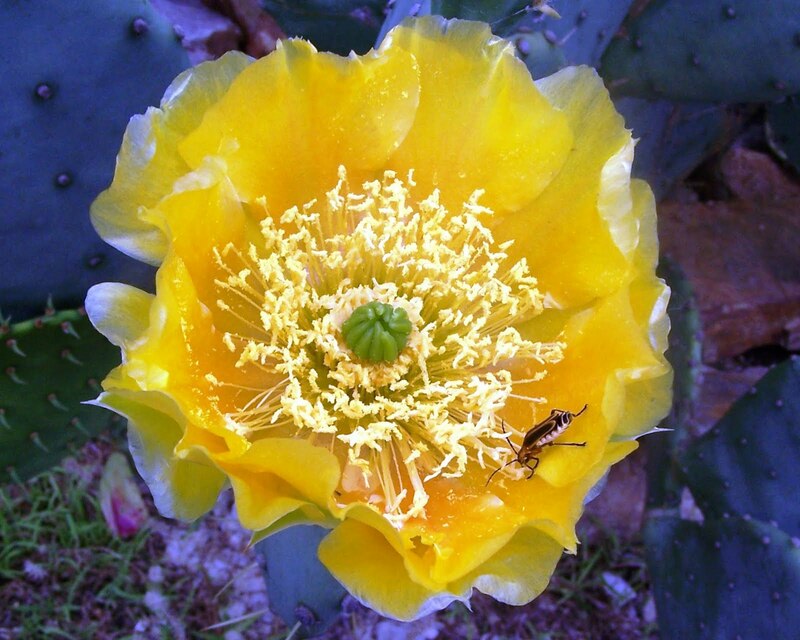 We have a large prickly pear cactus growing in a rock garden next to the Peace Bee Farm honey house. The cactus is a typical desert dweller. 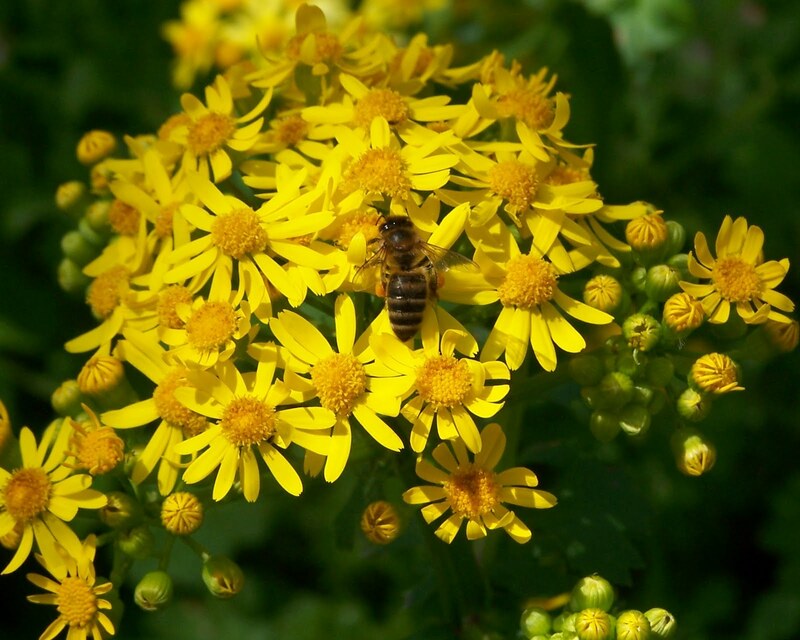 The plant’s beautiful flowers don’t attract honey bees, even though they are plentiful in the area. In the desert, where honey bees are rarely found, plants must rely upon other pollinators, often night-flying bats, moths, or other insects. Click on the photo to see a soldier beetle pollinating our cactus. After new queen bees have made their mating flights, they continue to develop their reproductive organs for several days before they begin to lay eggs. During this time, nutrition is important for development of quality queens. To produce productive queens, the beekeeper needs to ensure that there is plenty of food in the form of honey and pollen in the hive. Since the nucleus hives were established with young nurse bees, there may not be an adequate population of older foragers to collect enough food for the queen and colony. If food stores are lacking, supplemental feeding of sugar syrup and pollen substitute can be done. Pollen substitute patties fed to bees in warm weather are particularly attractive to small hive beetles. If beetle larvae appear in the pollen substitute patties, they should be removed. When the new queen begins to lay eggs, they may be few in number at first. There may even be more than one egg in a cell during the queen’s early attempts at brood production. The first eggs that she lays may be infertile, resulting in drone brood. However, a good queen will rapidly develop a pattern of laying a single egg in each cell. The pattern of brood production should move toward large areas of continuous worker brood with few holes or empty cells. 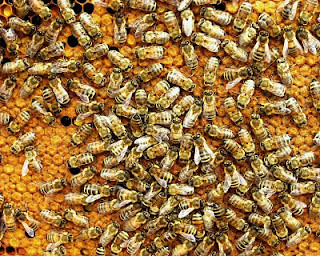 The beekeeper’s brood evaluation begins in the queen mating nucleus hives and continues after the bees are moved to permanent, full-size hives. The amount of brood and the number of holes in the brood pattern can be used in judging the quality of a queen. The photo shows an excellent pattern of larvae-stage, capped brood. Inbred queens produce inferior offspring that are removed from the cells by the workers. Workers exhibiting hygienic behavior also remove pupae that have parasitic Varroa mites developing with the honey bees in the brood cells. In this case, finding holes in the brood pattern indicates a queen passing along good traits to her offspring. Beekeepers will do everything that they can to protect honey bees. However, there are times that bees are positioned where they create a safety hazard or they cannot be removed alive. We are called upon regularly to handle feral colonies in structures or swarms close to people. Just this evening, I was asked to take care of a swarm of bees close to the front door of a house occupied by small children. The residents were surprised that I was able to move the bees from the cedar tree branch to a box held underneath by giving the branch one sharp shake. Often beekeepers can discuss a number of options available to people who find that they are sharing space with honey bees. Many people are willing to leave a honey bee colony in place if it is in a hollow tree or a building wall. The determining factors are often the position of the entrance to the hive and how close the bees’ flight path is to humans. Bees are moved for a number of reasons. Swarms are captured and carried to managed bee yards. Hives are carried to farms to pollinate crops. Hives are moved between a beekeeper’s dispersed bee yards. Hives are bought and sold. 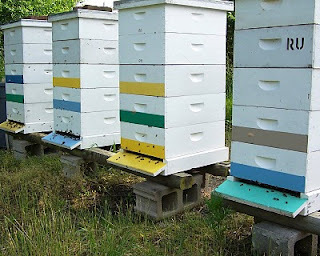 Hives are usually moved when colonies are divided. Changing land usage often requires bee yards to be moved. 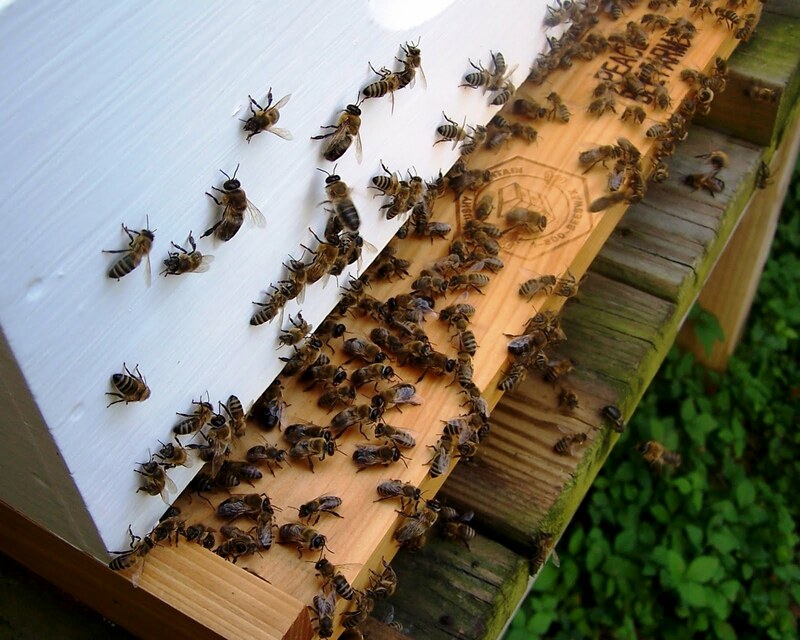 Regardless the reason for moving bees from one location to another, problems can arise. The problem often is the result of bees escaping from the truck in which they are being carried. This occurred at a truck service company in nearby West Memphis, Arkansas at a major crossroads in America’s interstate highways. A migratory beekeeper’s truck was brought into the service bay with a flat tire. While the tire was being repaired, honey bees escaped from the netted truck. Most settled above the 18-foot-high doors to the shop. A number of workers were stung. Tod Underhill killed the bees with soapy water. One of my beekeeping friends recently asked me what it means when you find a large number of drones in the hive. My response may not have elicited great confidence in me. I said that finding great numbers of drones in the hive might mean that the hive is in trouble, or it might mean that the hive is healthy. Shirley Murphy watched a hive with an exceptionally large population of drones slowly dwindle. At the time that the problem started, she didn’t have extra queens or brood and bees available to help her take corrective action. When these became available to her, she found the colony near collapse. Only the queen and a few attendant bees remained in the hive. Wax moths had started consuming the honeycomb, leaving a mess of webbing and feces. A mouse had moved into the unguarded hive. The hive problem, which first presented itself with a large population of drones, started when the queen depleted her lifetime supply of sperm that she gathered at mating time. Without sperm, she could not lay fertile eggs to produce workers or queens; she could only produce the male drones from her infertile eggs. Honey bees produce offspring by either fertile or infertile eggs. Reproduction from infertile eggs, known as parthenogenesis, is unique in the insect order hymenoptera. The order includes bees, wasps, and ants. A visit to the Peace Bee Farm hives on display at the Children’s Museum of Memphis found large numbers of drones in each hive. Here, the colonies were strong and healthy. Large numbers of drones were being produced to provide male reproductive bees to mate with queen bees. This is a normal occurrence in the spring. If you click on the photo, you can see a number of drones, the larger bees, leaving and entering the hive. The drones fly from two to four hours each afternoon searching for queens. 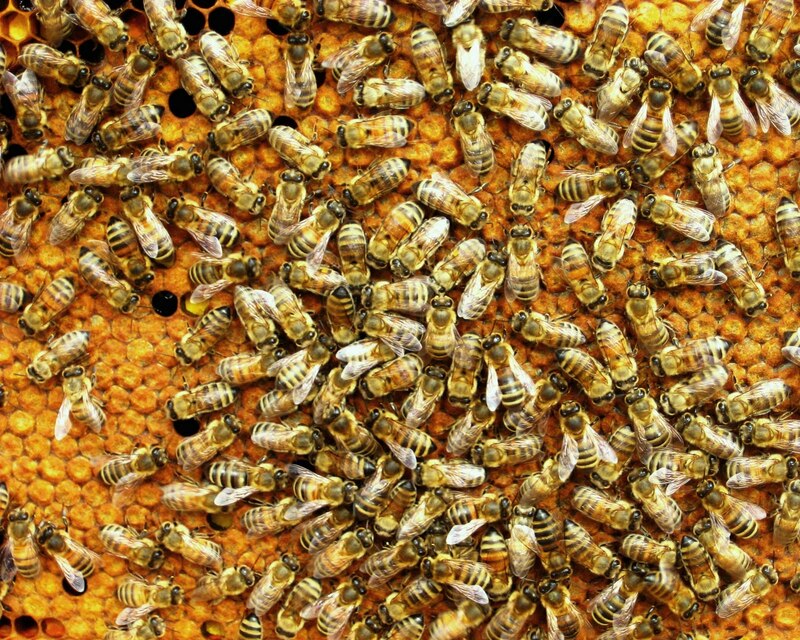 Mating in flight with queen bees is the sole work of drones. In today’s photo we see a bumblebee foraging for nectar on white clover. White clover probably can be considered the most important honey plant. When the temperatures range between 80 and 90 degrees Fahrenheit, clover is a prolific nectar producer. Though the blossoms have been observed for quite a while, clover requires warm days to secrete large amounts of nectar. Clover is a member of the important family of bee plants, the legumes. 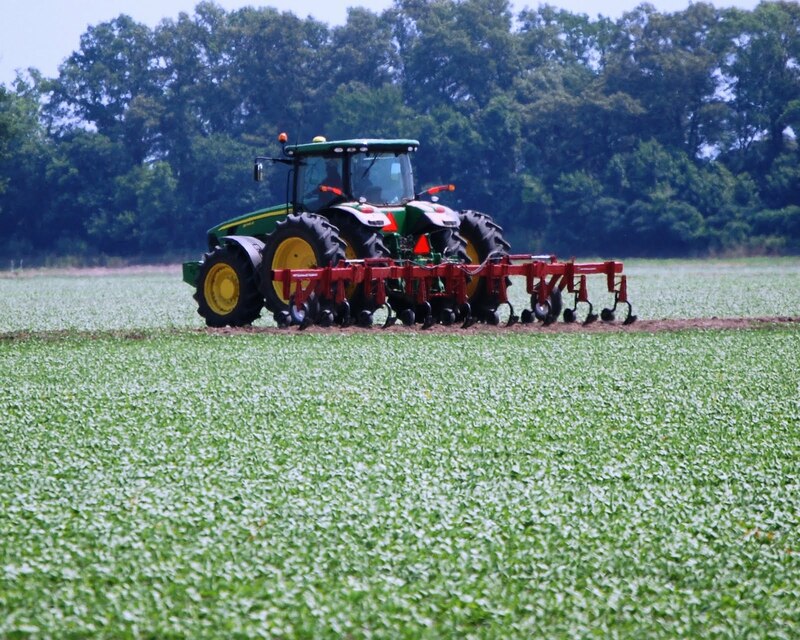 Like a number of legumes, clover serves an important role in fixing nitrogen into a usable state in the soil. Even though the atmosphere is largely comprised of nitrogen, it is not available for plants to use. Bacteria growing on the roots of the clover plants are the active agent for converting the nitrogen. The result is increased soil fertility. Along with the clovers, the legume, or pea, family includes a number of important bee plants: peas, beans, peanuts, alfalfa, soybeans, lespedeza, vetch, kudzu, redbud, mimosa, locust, and Kentucky coffeetrees. Many of these plants provide food for wildlife and animal forage. Clover, alfalfa, and lespedeza are used as pasture crops for cattle; while soybeans are processed into feed for livestock and poultry. 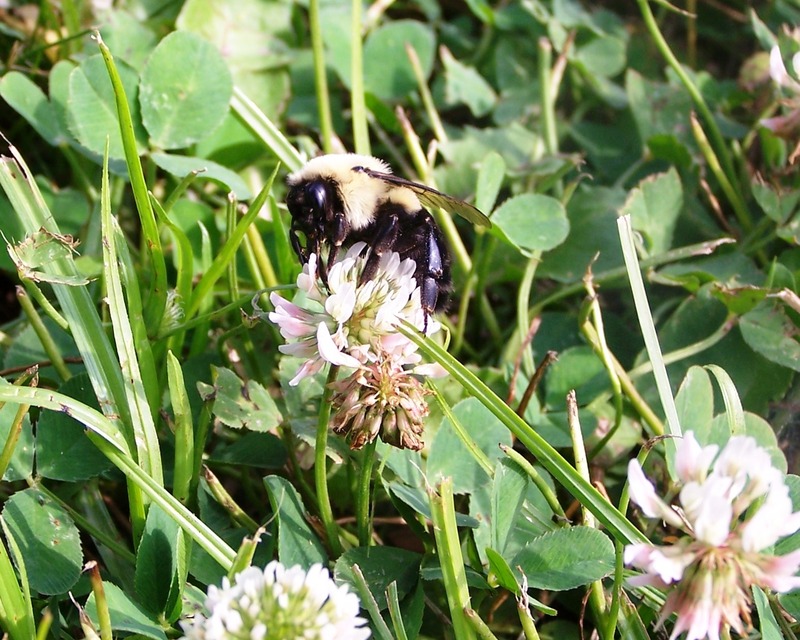 Beekeepers plant clover around bee yards and in spare patches of land. The plant has a hearty root system and is easily propagated by seed. The seed is produced when honey bees forage the flowers. I often find the foot prints of deer in stands of clover around bee yards. As well as being an important forage plant for honey bees, it provides high-quality food for wildlife. Clover honey is light in color and mild in flavor, making it one of the favorites with the public. Bumblebees, like the one shown, are dwindling in many areas due to the loss of habitat. The Xerces Society for Invertebrate Conservation is attempting to make people aware of the potential for pollinator habitat restoral along the nation’s roadsides. You can read more at: http://www.xerces.org/pollinator-conservation-roadsides/.